Before Roger Williams set foot in the New World, the Narragansett farmed corn and squash, hunted beaver and deer, and harvested clams and oysters throughout what would become Rhode Island. They also obtained wealth in the form of wampum, a carved shell that was used as currency along the eastern coast. As tensions with the English rose, the Narragansett leaders fought to maintain autonomy. While the elder Sachem Canonicus lived long enough to welcome both Verrazzano and Williams, his nephew Miatonomo was executed for his attempts to preserve their way of life and circumvent English control. 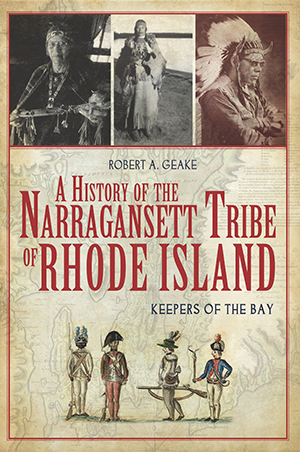 Historian Robert A. Geake explores the captivating story of these Native Rhode Islanders as he chronicles a history of the Narragansett from their early European encounters to the tribes return to sovereignty in the 20th Century.